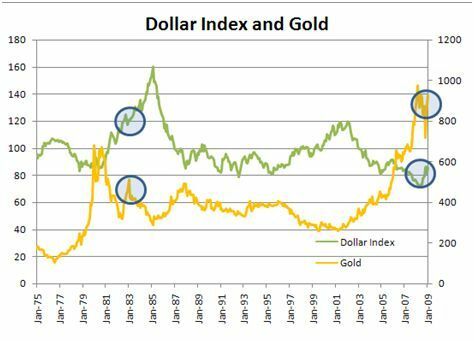 It is not very often that we see the US dollar and gold prices move in the same direction. Since gold is priced in dollars, the value of the yellow metal tends to fall when the dollar rises and rise when the dollar falls. However this has not been the case since January 14th as the rally in the US dollar corresponds with the rise in gold prices, which closed today at a 7 month high of $970 an ounce. The last time we saw this traditionally negative correlation turn into a positive one was in 1982. At that time, recession hit many countries including the US. Although the rise in gold prices can be partially attributed to future inflation problems, the cohesive movement in the value of gold and the US dollar suggests that central banks around the world are losing credibility. There are growing concerns that a time bomb could explode in Europe leading to more troubles for the region as a whole. If that is the case, there may not be any safer form of investment than gold. The rally in the US dollar and gold is telling the market that investors are worried about global economic stability outside of the US and therefore they are preparing for the worst.